What were Slave Plantations? Definition of Slave Plantations: Slave Plantations can be defined as large farms in the colonies that used the enforced labor of slaves to harvest cotton, rice, indigo, sugar, tobacco and other farm produce for trade and export. Typical Slave Plantations ranged from 500 to 1,000 acres and each acre produced about 5,000 plants. Slave Plantations were vital to the profitability of the large farms located in the Southern colonies in Colonial America. 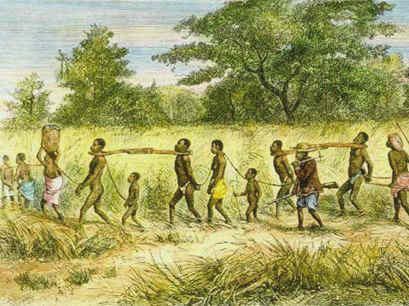 The agriculture system based on Slave Plantations was implemented in the Southern Colonies during the Colonial period. The five Southern Colonies who introduced the system of Slave Plantations were composed of the Maryland Colony, Virginia Colony, North Carolina Colony, South Carolina Colony and the Georgia Colony. The reason that Slave Plantations sprang up in the South was due to the geography and climate of the Southern colonies. The slave trade started in West Africa when unfortunate men and women were forcibly dragged from their homelands and forced on to the slave ships. The slave ships followed a terrible 3000 mile route called the Middle passage to the West Indies and later to America. This Atlantic trade route was part of the English policy of Colonialism, Mercantilism and Triangular Trade. 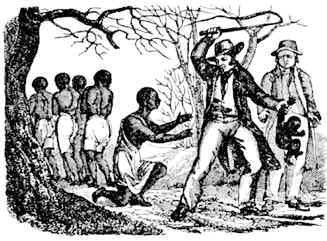 One the slaves had reached the areas of the Slave Plantations they were sold at slave auctions. The economy of the Slave plantations were based on a system of agricultural mass production requiring a large labor force. 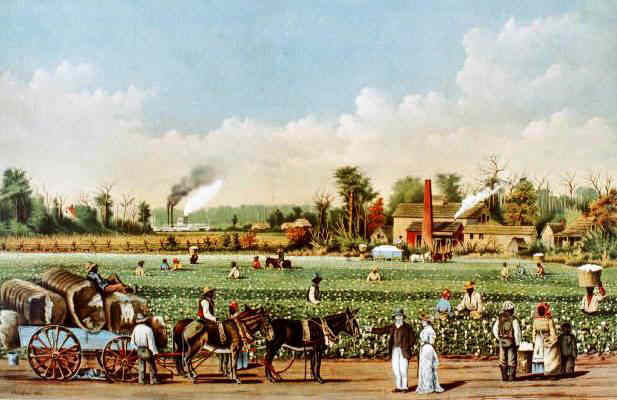 Southern Slave Plantations were labor intensive requiring thousands of slaves across the southern colonies. There was no machinery to help the slaves and only oxen and horses for power - and these were in short supply. Vast areas of land areas had to be cleared for planting and crops had to be sewn and harvested by hand. Cheap labor was essential for the Slave Plantations to become profitable. Tobacco, rice, cotton, sugar cane and indigo were valuable plants and grown as cash crops. The owners of the large Slave Plantations were called planters and belonged to the planter aristocracy of the Southern Colonies. The owners of the Southern Slave Plantations were often the younger sons of British landowners, who perpetuated the English system of the 'landed gentry'. These wealthy owners emulated the lifestyle of the noble aristocracy and gentlemen farmers of England. The planters used some of their slaves as household servants. The houses of the planter aristocracy lived in Georgian style mansions often featuring frontages with Grecian style columns and large verandas. On the large Southern Slave Plantations the owners relied heavily on overseers to run their Slave Plantations. Overseers were men hired by planters to manage and direct the work of slaves. Overseers were usually from the white, badly educated lower class - totally different from the refined plantation owners. The overseers were under considerable pressure from the plantation owners to maximize profits. In order to meet the requirements of the owners the overseers used fear to motivate the slaves and increase productivity. The punishments used by the overseers against slaves included the use of the cart-whip. The the role of the overseer in the Slave Plantations gained scant respect - they were looked down upon by the owners and slaves alike. Life on the Slave Plantations in some ways emulated the life of a small village. Some of the Slave Plantations were massive and consisted of the main house or mansion, slave quarters, a dairy, blacksmith's shop, laundry, smokehouse and barns which made the Slave Plantations to large degree, self-sufficient. Crops were traded for items that could not be produced on the Slave Plantations. These items included farm tools, expensive textiles and furnishings, shoes, lace, and dishes. Slaves, both men and women, worked all year round undertaking back breaking work for up to 18 hours per day. The women were compelled to do as much as the men even if they were pregnant. The use of slaves kept the costs down on the Slave Plantations. The plantation slaves lived in basic, crude wooden cabins consisting of one or two rooms, often with a dirt floor, in the slave quarters. Discover interesting information and facts via this history timeline of Slave Plantations in the Southern Colonies. 1607 The first permanent colony in America was founded at Jamestown, Virginia. 1664 Maryland mandates lifelong servitude for all black slaves. The other Southern colonies of New York, New Jersey, the Carolinas, and Virginia all pass similar laws. 1705 In Virginia Slaves are described as real estate and allows slave owners to bequeath their slaves. The same law allowed slave owners to “kill and destroy” runaway slaves. 1708 Slaves outnumber colonists in South Carolina. 1790 The Census reveals that there are nearly 700,000 slaves in a nation of 3.9 million people.